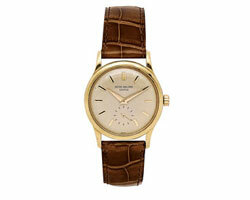 A gentleman’s gold ‘Calatrava’ wristwatch by Patek Philippe, circa 1960. Mechanical timekeeping began in the 15th century in the form of clocks powered by variously configured internal springs. For greater accuracy, Leonardo da Vinci‚Äôs clock measured minutes as well as hours, using two separate trains with independent weight, gears, and escapement. A 16th – century German named Peter Henlein is credited with creating the first timepiece to be worn on the person ‚Äì the so-called pocket watch. 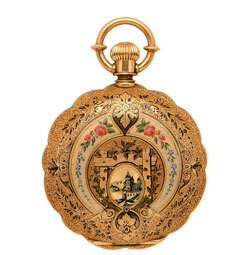 Over the course of the next 400 years, pocket watches evolved in accuracy, form, and function. Every respectable gentleman owned at least one, usually worn in the vest pocket attached to a heavy chain sporting a decorative fob at the other end. For the most part, women did not wear these timepieces as such items were considered manly. This changed toward the end of the 19th century when women began wearing pendant watches on chains that swung twice around the neck, a swivel clasp suspending the circular timepiece. By the early 20th century, these ladies‚Äô watches became more in the line of decorative jewels, their outer cases enhanced with enamel and gems. 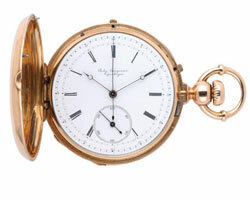 From this evolved a new timepiece initially called wristlets, which were worn by both men and women. The wristwatch came next, adapted for use by the military due to the practicality of viewing the timepiece‚Äôs face when worn on the wrist. The tactic of accurately synchronizing battle plans was an important weapon used by the British during the Boer War (1899-1902). The flexible metal strap was invented soon after by Wilsdorf & Davis in London (later to become Rolex), followed by horns or lugs attached to the outside of the case to accommodate leather straps. Collectors can‚Äôt seem to agree on a strict definition of ‚Äòvintage,‚Äô but the growing consensus is in reference to mechanical watches made before the advent of the quartz revolution on the 1970s. Some would argue that vintage should only refer to watches made before 1950. In any case, many of today‚Äôs styles had their origin in those times. The main appeal of vintage watches is the history they evoke, both in their innovation and the events of the times. Wristwatches became more and more popular as a ladies fashion accessory during the first two decades of the 20th century. However, for the military, it was an indispensable piece of equipment for the Allied troops during the First World War. After the war, the returning soldiers were allowed to keep their trench watches as souvenirs. These war heroes were seen everywhere sporting their wristwatches and the public‚Äôs perception changed forever. The trendsetting Cartier lost no time in designing a watch in remembrance of the tanks debuted by the British in France at the Battle of the Somme in 1916. Thus was born the very popular platinum Tank model men‚Äôs watch. During the 1920s, many innovations ensured the survival of this new form of adornment for both men and women. For instance, watches became more resistant to water and dust. In 1926, Rolex introduced the first truly waterproof wristwatch, which it branded the ‚ÄòOyster‚Äô. The durability of metal dials for wristwatches quickly replaced the fragile porcelain dials that harkened back to the pocket watch. Protective crystal watch face covers were now made from plastic, rather than glass. In¬† the 1920s, watchmakers integrated a rotor in the movement of some watches and this feature became widespread by the 1950s. The majority of men‚Äôs watches during the 1920s, `30s, and `40s were square or rectangular and considerably larger than ladies‚Äô watches, which were smaller and circular or square in design, usually accented with diamonds on the case and bracelet. There was no end to the various designs produced for both men and women by Swiss watchmakers or bejewelled by retail jewellers of the day. Cartier and Tiffany & Co., utilized movements from various Swiss watch factories, including Movado, Longines, and Patek Philippe. In the closing decades of the 20th century, these original vintage watches have become highly collectible. It is not unusual to find such watches restored with redone dials, replaced movements, and even outright alterations to the case and bracelet. Authentic watches in original good condition are becoming exceedingly rare and the demand continues unabated. 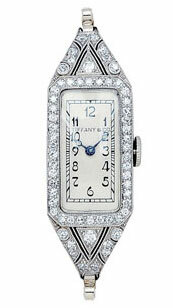 Many of the original models have been copied or modernized, starting with the Cartier Tank watch in the 1970s. Since the 1950s, many new developments have influenced the form and function of watches. Some of these include the functions of displaying the day and date, which was introduced in the 1950s, along with battery-driven watches. Electronic digital watches and quartz timepieces became wildly popular in the 1970s, and companies produced models with specific professions or hobbies in mind, such as diving and racing. Complicated watches that were more difficult to produce early on have now become commonplace. These days, for a man of business, a good watch is as important as a good suit. An 18-karat gold watch by Jules Jergensen, circa 1870. 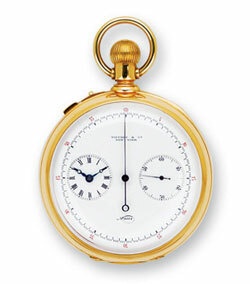 An 18-karat gold split-second chronograph watch, Tiffany & Co., circa 1880. A ladies’ Art Deco diamond wristwatch,Tiffany & Co., circa 1920. Enamel and 18-karat gold watch, American Watch Co., circa 1870.